Back: Ferdinand keeps it short! We’ve all done it…sent a perfunctory postcard with only the words “thinking of you” or “wish you were here” or even “warmest greetings from your friend.” But it’s definitely the thought that counts, and given that Ferdinand has written to his friends every step of the way so far, he can be forgiven for the rather brief message on the card that’s featured this week. A few comments on the message before discussing the monument on the postcard. First, this is the first time we hear that the communication is two-way – he’s receiving letters from his friends! Second, the weather sounds a lot like my last trip to Germany…I think it’s a universal trait of human nature to whine about unpleasant weather while on vacation. Only six days of sunshine? Poor Ferdinand, he’s been there for a month! Finally, Schwörie must be a nickname or name of a friend…the name comes up in a few of Ferdinand’s postcards and must be part of their group of friends. My research on the image on the card has given me a lot of information though! 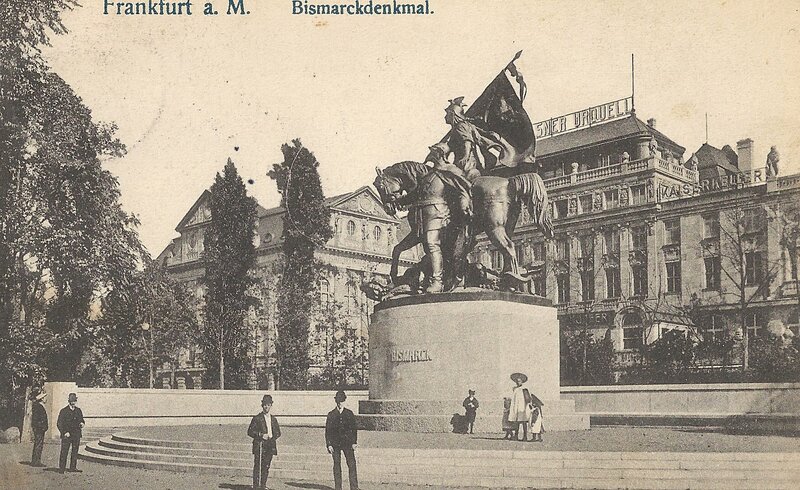 The card features a photo of the Bismarckdenkmal in Frankfurt, a massive monument built in honor of Otto von Bismarck. The monument was created by German sculptor Rudolf Siemering who made quite a few monuments throughout Germany. It appears that this particular one, however, no longer exists – it was melted down during World War 2. But at the time of Ferdinand’s visit, it was relatively new. Wikipedia claims it was erected in 1908; however, Siemering died in 1905 so I’m not sure if that is correct or if it didn’t get put in place until years after he created it. In reading about Rudolf Siemering’s life, I found a very interesting parallel. Ferdinand didn’t have to travel back to Germany to view one of his monuments to a great man – because there was one in his new home in Philadelphia. 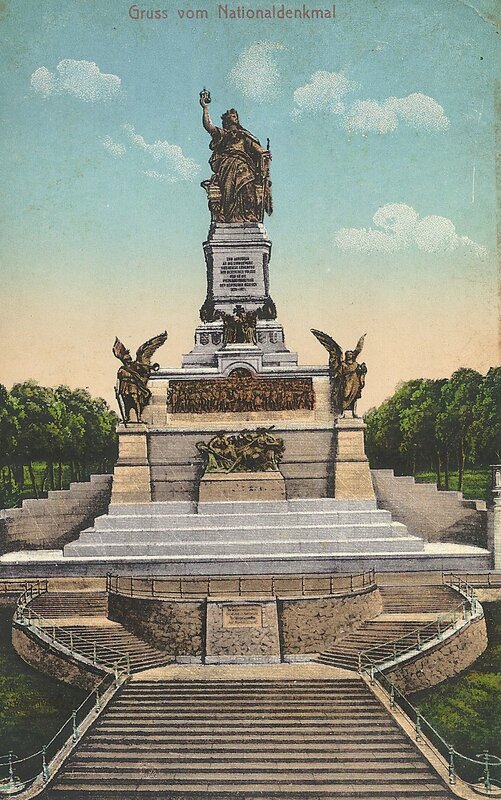 In 1879-1880, an international competition was held for a Philadelphia monument to George Washington. Siemering submitted the winning design, and he completed it in 1897. President William McKinley presided at the dedication ceremony. The original location of the monument, which is where it stood at the time of Ferdinand’s arrival in Philadelphia as well as his trip back home, was in Fairmount Park. 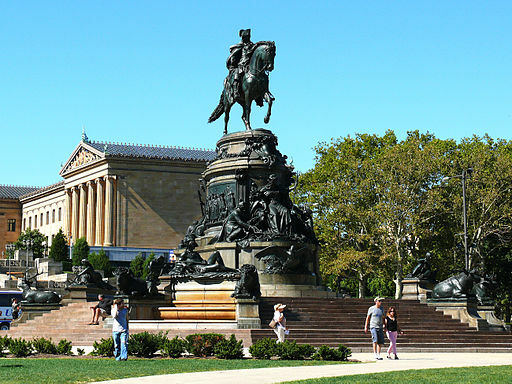 But it was moved in 1928 to the Benjamin Franklin Parkway in front of the Philadelphia Art Museum and it still sits there today. Last summer I actually used it as a “meet me” point for some friends, and as I waited I admired the sculpture without knowing any of its history. I’d love to know how it was moved in 1928 – it is massive. At the top is the statue of Washington on his horse. The pedestal shows an allegorical America and two German-Americans from history, Peter Muhlenberg and Friedrich Wilhelm von Steuben. The bottom area has figures of native Americans, large animals native to America, and four famous American rivers – the Delaware, Hudson, Potomac, and Mississippi. Was Ferdinand familiar with the Washington monument in Philadelphia? And did he know that the sculptor was the same as the Bismarckdenkmal in Frankfurt? Both equestrian monuments are dedicated to great leaders. Bismarck unified Germany into one nation in 1871 from thirty different kingdoms, city-states, and principalities and during his 19-year reign as chancellor he kept Germany out of military conflict. Washington unified the thirteen colonies against Great Britain and became the father of America (and also kept America out of the conflict between France and Britain). Both leaders are so respected in their own countries that there are monuments dedicated to these two men all over their home countries. Oddly enough, I found statues of them in other countries as well, but I couldn’t find a Washington monument in Germany or a Bismarck monument in the United States. In this series, Ferdinand Müller, a German-born naturalized U.S. citizen living in Philadelphia, has returned to Germany in 1912 for a trip. 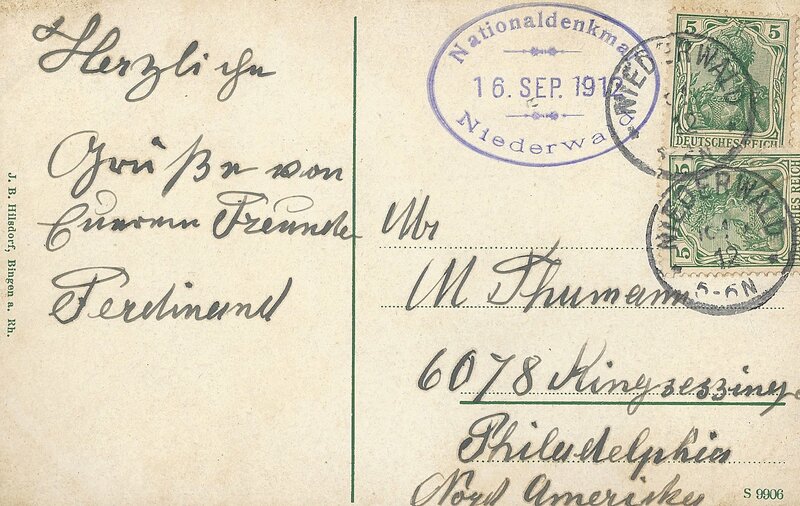 Along the way, he writes to his friends back home, Max and Laura Thumann (my great-aunt). 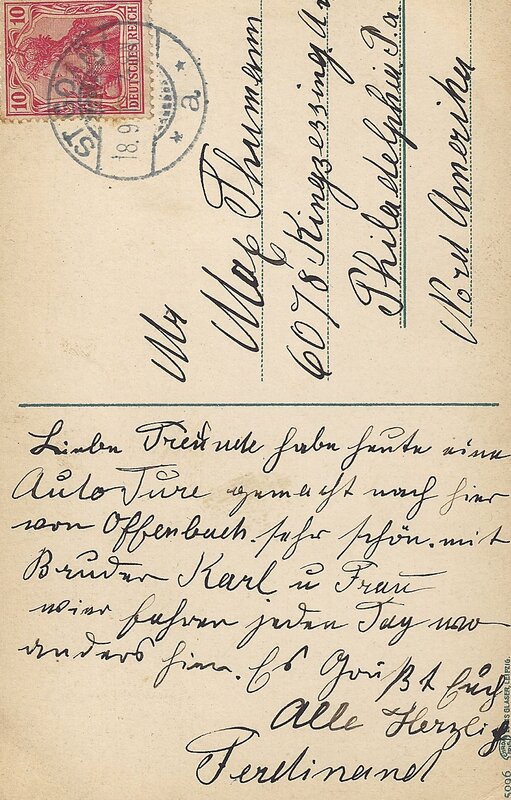 On last week’s card, dated 28 August 1912, Ferdinand was on his way to Munich. But the next card in the collection is over a week later! Either Ferdinand was too busy to send a postcard (highly unlikely!) or perhaps Laura gave the card to her brother who had lived in Munich for a while. Or it was simply lost over time. Unfortunately we don’t have details about Ferdinand’s time in between, but now it’s September and he’s been back in Germany for almost a month! Back: Cruising alone the Rhine river – in a car! Who got to ride “shotgun”? Ferdinand is cruising along the Rhine this week, only in a car, not a boat. The last card I posted had a car shown on the front which led me to research car makes and models in existence in 1912. I wasn’t able to identify it, but now Ferdinand remarks that he’s off on a car trip with his brother, Karl Müller, and Karl’s wife. I wonder what kind of car they had and how common that was (or wasn’t) at the time. I would assume that a car-owner at the time would be on the wealthier edge of society. The road trip he shares with his friends back home is to Loreleifelsen. 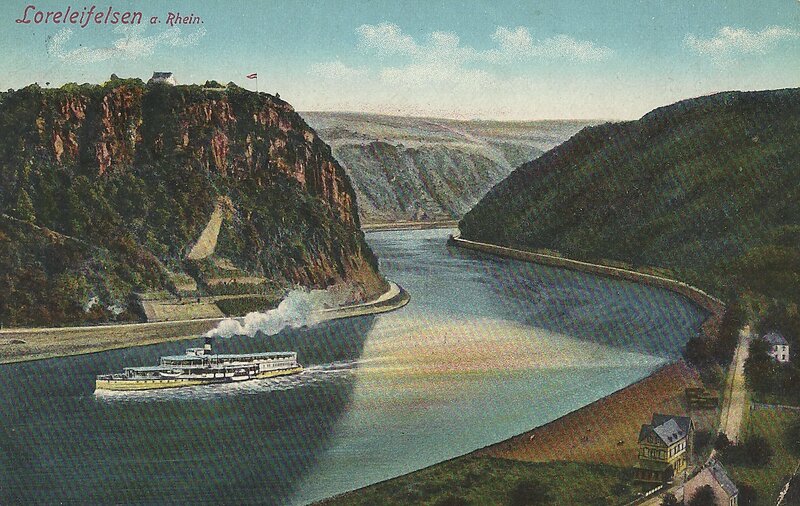 The Lorelei (or Loreley) is a large rock on the bank of the Rhine River near St. Goarshausen. Maybe “large” is an understatement – it soars about 400 feet above the river along what’s known as the Rhine Gorge that runs between the towns of Koblenz and Bingen. The name come from a word in the Rhine dialect that means “murmuring” and a Celtic word for “rock” – the Lorelei is the murmuring rock with the strange sound coming from the currents, a small waterfall, and an echo effect off of the rock! Of course, given the nature of the rather unusual natural phenomenon, many myths attempt to tell the true story. One story attributes the murmuring sound to dwarves living in caves nearby. An 1801 poem speaks of a woman named Lore Lay who is sentenced to a nunnery for an act of betrayal. On the way to her punishment, she asked to stop at the rock for one last view of the Rhine. But from the top she leapt to her death…and the rock has echoed her name ever since. In 1824 poet Heinrich Heine built upon that theme with a beautiful female atop the rock bewitching sailors with her singing and causing them to crash. Whether or not a siren-like female was to blame, this part of the gorge is quite dangerous and ships have crashed in the area – most recently a big tanker full of sulphuric acid in 2011. It may be just a big rock along the river, but it sure is beautiful. And one thing’s for sure – it’s as big a tourist attraction today as it was in 1912 for Ferdinand and his family. 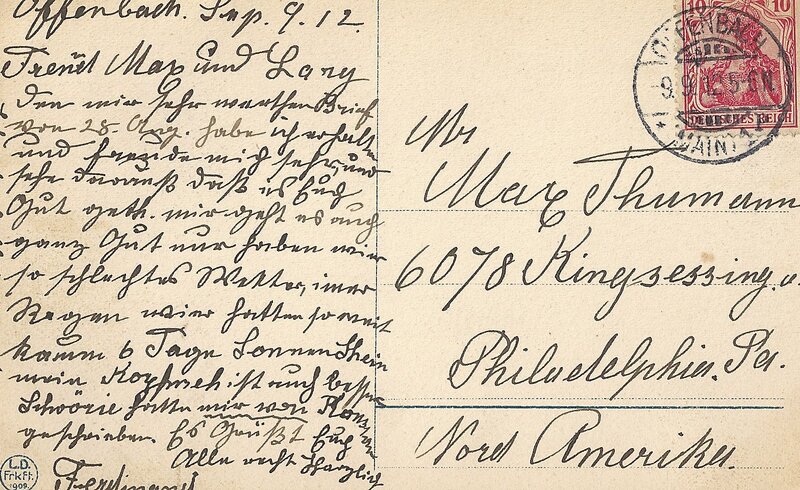 In this series, Ferdinand Müller, a German-born naturalized U.S. citizen living in Philadelphia, has returned to Germany in 1912 for a trip. 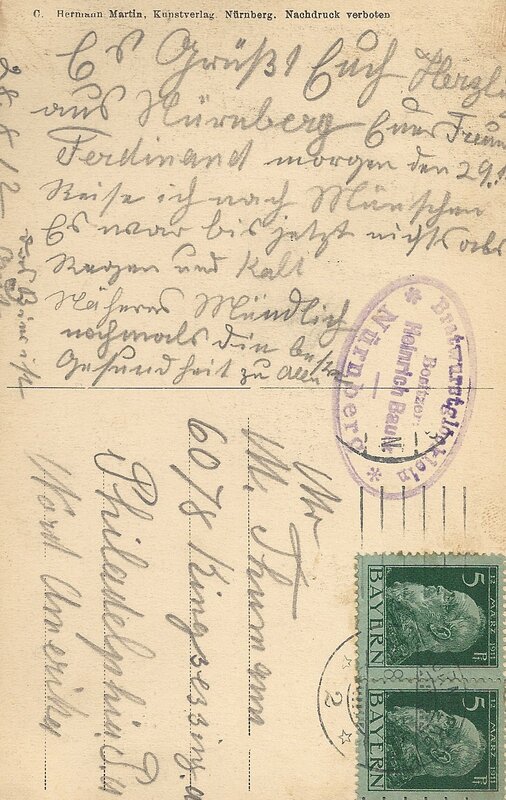 Along the way, he writes to his friends back home, Max and Laura Thumann (my great-aunt). About two weeks into his trip, Ferdinand is settled in Offenbach and taking day trips from there. Today he’s off to Nürnberg, about 135 miles away so he’s likely stopping there on his way to Munich. Nürnberg 28.8.12 Sending you greetings from Nuremburg, your friend Ferdinand. Tomorrow, the 29th I travel to Munich. Until now it was only rainy and cold. More orally. Again, best wishes to all. Ferdinand once again mentions traveling to Munich and he’s more than halfway there from his original location of Offenbach. But the weather! Some things never change – when you’re on vacation and it’s rainy and cold, you just have to complain about the weather. In fact, this is reminiscent of one of my own trips to Germany in 2006 where I had a string of cold and rainy days in late March. So what’s a traveler to do when it’s cold and rainy? Whether it’s 1912 or 2006, the answer is the same – you find someplace warm inside and have something to eat! And when one is in Nürnberg, there is only one meal to have – bratwurst! You can find all kinds of wurst all over Germany, but the first documented evidence of the sausage comes from the city of Nürnberg – all the way back to the year 1313! Six hundred years later, the weary traveler Ferdinand stops by the city to enjoy the same treat. The bratwurst that’s particular to Nürnberg is a small sausage more akin to what Americans would consider to be breakfast sausage. It’s a pork sausage seasoned with marjoram that gives it a distinct taste and is usually accompanied with sauerkraut or potatoes. 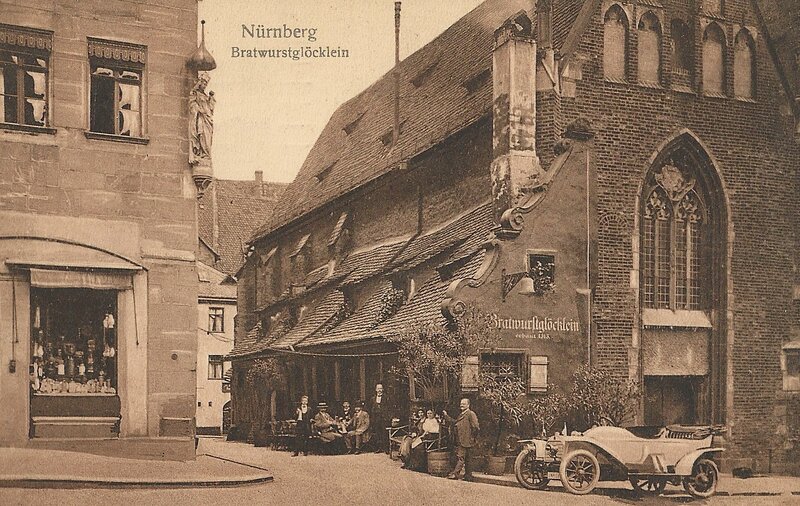 The particular restaurant that Ferdinand stopped in – assuming the postcard photo represents the actual place he went – is called the Bratwurstglöcklein. 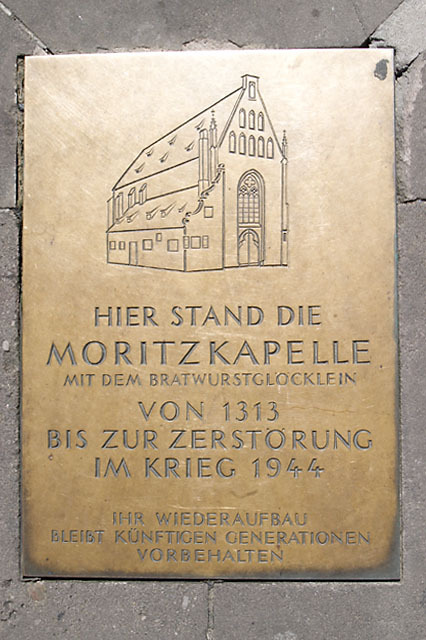 It was attached to the Moritz chapel (note the stained glass window to the right in the postcard) and was renowned for its freshly made sausages. In 1944, the chapel and restaurant were destroyed in air raids, but there is a restaurant on the spot today bearing the name (not so for the chapel). I tried my best to identify the automobile in the lower right of the postcard, but I didn’t have any luck. I did not think there were quite so many car manufacturers in the 1911-12 time period! After going through images of various German, French, Italian, and British possibilities, I decided to let someone who is much more informed about antique cars find the image here and leave a comment identifying it.